How did this Easy Instant Pot Gourmet Chicken Cordon Bleu come about? Last week I was in the mood for Chicken Cordon Bleu. I was thinking I might try and make a comfort type dish in my Instant Pot. I had my own Chicken Cordon Bleu recipe in mind to make over but I decided to check out the internet for inspiration and found one that sounded pretty good. In fact the recipe I found was rated high and one person said her family loved it so much – she made it twice in one week! Score! Well not really. Just keep reading…. Just for kicks I decided to put in the ingredients for the dish into Weight Watcher’s Recipe Builder, knowing full well it was probably high in calories and points. I have to say I was totally shocked. While I was prepared for a high point dish, it came back as 21 points! Yuck! Definitely not for me! I only get 23 points a day, so that’s about all I could eat for the day. No thank you! No wonder so many people are overweight! And the lady that recommended it made it twice in one week! Immediately I went to work on my own version. I decided to add broccoli as it needed more “bulk,” in it so it would be more filling and make at least 6 servings. My version is a combination of my Chicken Cordon Bleu, Chicken Diane and Chicken Divan. Tada! I’m happy to present this one, Easy Instant Pot Gourmet Chicken Cordon Bleu only 7 Freestyle Smart Points (or 356 calories per serving). Much better. And the points in the cheese are so worth it!! Serve it over butternut squash noodles or zucchini noodles for a perfect comfort dish! (I serve it over pasta for my kids though – neither one of them like butternut or zucchini and they need the calories-one is training to become a fire fighter and lifts weights so he eats a ton! The other one is super skinny.) With the pasta, however, they love this dish! 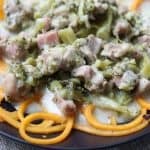 Creamy, cheesy, chicken, ham and broccoli all brought together in this delicious and quick Instant Pot recipe. Serve over butternut squash spirals, zucchini noodles or pasta. Definitely a family pleaser! Only 7 Freestyle Smart Points per serving. Press, “Sauté,” on your Instant Pot. Add 2 t. oil and then also spray a non-stick skillet with a bit of oil from your Misto sprayer. Add onions and garlic and cook for about 2 minutes, stirring occasionally and spraying a bit more oil if needed. Add chicken and cook for about 1 minute. Turn off Instant Pot. Add ham, broccoli, rosemary, sherry, Worcestershire sauce, salt, pepper, chicken broth, and cream cheese. Cover Instant Pot with lid, set to seal, push, “Manual,” or on some models, “Pressure Cook,” and set for 3 minutes. Yes, really 3 minutes! It takes a while for the Instant Pot to heat up so by the time the 3 minutes is up, the chicken is cooked perfectly. When time is up, do the “quick” release and open pot. Use a spiralizer to cut the butternut squash or zucchini noodles. To cook the butternut squash noodles: spray a non-stick skillet with oil, toss in noodles and sauté until tender. If using zucchini noodles, only sauté until barely tender, otherwise they become too mushy. 1 Reply to "Easy Instant Pot Gourmet Chicken Cordon Bleu"
This sounds delicious! I’ve never tried butternut squash noodles; I bet they’re great with the creamy flavors of this recipe!